A few weeks after its acquisition of Seeo, Bosch was presenting samples of its solid-state cells at the Frankfurt Motor Show. Bosch believes that solid-state lithium-ion cells will enable doubling of energy density (no numbers were released), and expect that by 2020, costs will drop by half. Production of those new cells are five years from now, according to the press release. Of course we now after to frame everything in the context of the just released news of $145/kWh cells that LG Chem is currently offering to companies such as GM with the Chevrolet Bolt in late 2016. We have our doubts that the quote (above) was in reference to anything like the pricing and density of these new 2nd generation batteries. “Bosch is using its knowledge and considerable financial resources to achieve a breakthrough for electromobility,”. The acquisition of Seeo Inc. fits seamlessly into Bosch’s electromobility strategy. Bosch already offers a wide range of components for electromobility, from motors and power electronics to batteries. So far, Bosch has realized 30 production projects related to electromobility. At the same time, engineers are working on further refining the technology, and in doing so, making electromobility a more practical proposition. After all, by 2025, the company forecasts that roughly 15 percent of all new cars built worldwide to have at least a hybrid powertrain. In Europe, more than a third of all new cars will be electrically powered – the majority as plug-in hybrids. To this end, in 2014 Bosch joined GS Yuasa and Mitsubishi Corporation in establishing the joint venture Lithium Energy and Power GmbH & Co. KG, whose objective is to develop a more powerful generation of lithium-ion batteries. Seeo Inc.’s technology complements the work done thus far with Bosch’s Japanese partners. The result will be a combination of groundbreaking start-up technology with Bosch’s systems and technology know-how, GS Yuasa’s cell competence, and Mitsubishi Corporation’s broad industrial base. 35 Comments on "Bosch Highlights Range-Doubling Solid-State Cells"
Awesome, if Bosch are confident about this stuff then so am I. It isn’t like Bosch to make wild flights of fancy. It seems Bosch got pretty fancy with VW ECU’s. If they could just make us think a decent battery is years away, they could get back to selling them. That article you just linked was terribly written. I quote “Bosch (the company that supplies electronics to the auto industry) warned VW only to use the cheat mode internally back in 2007” which implies Bosch deliberately instructed VW to use the cheat device. This is false. Bosch advised AGAINST doing so. I said that Bosch aren’t prone to flights of fancy. A flight of fancy means a lie. Bosch did not lie about the ECU. They told the truth and VW chose to ignore them. That’s not the same as a lie. What is being verified is that Bosch programed the ECU’s, and how they documented and disclaimed what they would do if installed in Piech’s pet 2.0 TDI motors. Even if it isn’t Bosch’s responsibility, to ultimately to stop such installation, I doubt the court of public opinion will smile on them by the end of this. They coded the defeat. I’m more curious mechanically. The 2.0 achieved great power and efficiency, by progress in fuel metering. The more you lean the mix, the more NOx you produce. The rumor, sorry no polygraph, is that Piech didn’t want to give up on the R&D achievements by running rich (less fuel efficient), just to make a (LNT) lean nox trap effective. We’ll see where the fact mill goes, but this story fits what happened. Superiors to each Hatz and Hackenburg would have been Winterkorn and Piech. With NOx issues creeping up and Piech being unusually forced aside beforehand, it is becoming far-fetched that these two would not have known the path they were taking when BlueTec was abandoned. That quote means that Bosh told them to use it INTERNALLY (within VW) only, meaning they told VW to use it for VW’s testing, not for production use or emission testing use. ECUs were manufactured by Bosch and its subsidiaries/partners. The software configuration set is up to the customer but can also be done by Bosch. Its like you tell the IT guy what programs you want installed on your new computer. Highly unlikely that Bosch wasn’t fully aware of the VW trickery. This is vaporware until they actually put them into production and sell them and they work as promised. Seen this movie too many times fail before. Also Tesla, Panasonic and LG will have the same capacity by then and weigh 40% of what they do now. And will be $100/kwhr in 2020 or so. So Bosch better get cracking if they want to compete. And lithium batteries don’t take kindly to low QC Bosch does as that is what caused most of the fires chargers didn’t cause. Changes, most of the time, are incremental. 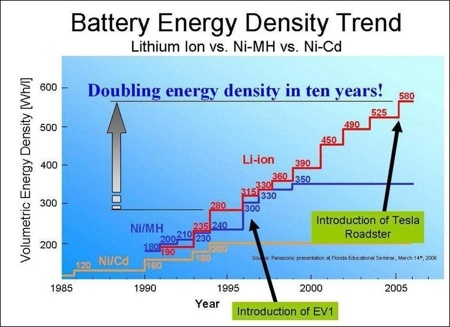 There wasn’t a huge step from NMH to lithium ion, nor has any other industry seen one huge leap forwards. So those cells could be a bit better than the 2016 LG cells, which are a bit better than todays Tesla cells, which again are a bit better than the cells used in the comparison they made. So by 2020, solid state cells will only be a consequent step to increase the energy density further, than one giant leap of doubling energy densities. I bet in 2020 we will hear stories about technology that will double the energy density of the 2018 developed cars from 250 miles to 500 miles by 2025. Microprocessors get better every year, but you won’t notice it until you look 10 years back. I agree that improvement in ED (Energy Density) in actual commercial products has been incremental rather than quantum jumps. But what you may be missing is that there are quantum jumps in the potential for increase in energy density. It’s certainly true that the first marketed li-ion cells didn’t have that much of an increase in ED over existing NiMH cells, but there is no way that NiMH chemistry could ever have resulted in cost-competitive commercial cells with the ED of current li-ion batteries. The claim for a 75% reduction of volume, if true, is frankly breathtaking. I assume that’s the maximum potential reduction, and not likely to be achieved in the first generation of such cells. But when it comes to EV batteries, reducing space is far more important than reducing weight. So altho we should be highly skeptical of any claims of new battery tech five years from production, still this does give me hope that within five years, we might finally see the tipping point at which plug-in EVs approach price parity with comparably-equipped gasmobiles! BASF thinks otherwise. It’s taking the road less traveled, working on developing a NiMH battery that will have 10x the density of today’s NiMH batteries, and cost only $150 per kWh. More power to them (BASF) if it works. No pun intended. We need this – many companies working on the energy density and $/kWh density from different angles to make sure we don’t pass up the best technology. Rationally, though, we should not expect the same pace of improvement to continue indefinitely. Future improvements may be faster or slower. Yeah, such graphs are interesting historically but you never know what the future brings. Technology has limits. Semiconductors have been hitting limits due to photolithography resolution, leakage from small transistors, thermal issues, etc. But we haven’t been working really hard on batteries for that long, so I’m guessing that there is much more room for improvements. But it will be slow, incremental, and hard fought. The current lithium batteries are more weight limited than volume limited. Only in certain cage classes. Not in motorcycles, not in bicycles, not in some cage classes either (partly due to engineering and management choices). Buses could go either way, depending. Ultimately, cages have to mind what laptops, tablets, and phones are doing, and these are VERY volume-limited. What? The step up to L-ion was almost a 33% increase in energy density. That’s hardly a small increment! Not flammable, with a pure lithium electrode? I don’t think so. A Breakthrough Would Change Everything! Yeah, unless it is a huge complex project like a nuclear reactor or a spaceship, any single project with five year time basically means “We have something and we THINK we can get it to work . . . give us money.” It may or may not pan out. Actually – 5 years time scale is very positive for a new technology. As stated by one of LG bosses any new chemistry will have to be tested for at least 5 years before it gets used in EVs. Cars -unlike laptops – are expected to last over a dozen years and manufacturers need to be confident that these batteries will be reliable, will last long enough and will be safe. This is industry standard. On the contrary, battery chemistry continues to be tweaked every year, and one problem with EV batteries is that you can never be certain how long they’ll last in actual use. By the time batteries in any particular EV have reached the end of their 8-year warranty, the auto maker will have long since moved on to different battery chemistries. Nobody, but nobody, is waiting five years before committing to using a particular battery chemistry in their production EV. If Nissan had done even one year of testing in real-world conditions, then they wouldn’t have had the problem it did with premature battery aging in hot regions in the MY 2011-2 Leaf. No, not for marginally different chemistries. A tweak here or there. For radically new chemistry, like solid state, yes the testing will be at least five years. The SEEO solid state cells require an operating temperature of 80 C (176 F) … a major drawback for any application but especially for automotive! That’s a lot less than the melting point of lithium, which is at 180 degrees Celsius. I wonder how the internals work? It’s quite reasonable that the separator needs elevated temperatures to work, but is the lithium a low melting point alloy? Woah . . . that certainly will present some problems. But it is still do-able. Zebra batteries used molten salts and they operate with temps like 250 C to 700 C! Cold start and cold climates are going to be the big issue. The zebra batteries I think so far have proven only viable for buses as they must be left attached to a charger when unused or else there is a 24 hour reheating process (obviously nonviable for a passenger vehicle). Ah, so it’s not just five years of testing they need but presumably more R&D to try and lower the operating temperature. At least they won’t have a problem with hot climates! The electric motors in modern RC cars (and planes already easily reach 80°C during a run, and more. Once Bosch can push these prototype batteries to market, perhaps in 5 or 10 years, they are already outdated.